It’s time to reveal our fifth Story Snug Advent Calendar! Two years ago I invited writers, illustrators and bloggers to tell us about their favourite books for a Story Snug Advent Calendar. I was bowled over by the response and wondered if anybody would like to join us this year. Once again responses to my invitations came in very quickly and I would like to say a huge, huge thank you to all the authors, illustrators, book bloggers and translators who have again helped me to put Story Snug’s Advent Calendar together. Our countdown to Christmas starts tomorrow TODAY and every day a surprise guest will tell you about the picture book that they most enjoy reading at Christmas. I have had a wonderful time opening emails to see which books our guests have chosen, only I know who is taking part and which books have been chosen so there will be surprises for all the participants too! It’s fascinating to see which picture books everybody will be reading over the festive season and I hope that everybody finds the books that they wish for under their Christmas Trees. 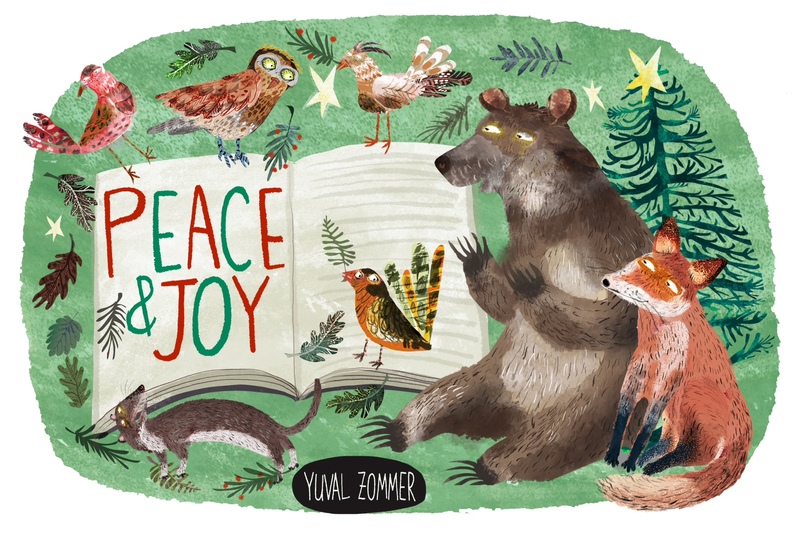 This year I was also extremely excited when author / illustrator Yuval Zommer very generously offered to design a special logo for Story Snug’s Advent Calendar. Yuval’s logo will be on all of our Advent posts and shows Christmas Storytime in the Forest. Thank you so so much Yuval, it’s absolutely beautiful! Yuval graduated from London’s Royal College of Art with an MA in Illustration. He has worked as a creative director at many leading advertising agencies and is now the author / illustrator of several highly acclaimed children’s books. Yuval’s picture books include One Hundred Sausages and Big Brown Bear’s Cave. His non-fiction large format title The Big Book of Bugs has been published in seventeen languages and is followed by The Big Book of Beasts. Yuval has also illustrated The Street Beneath My Feet, an exciting foldout book exploring our underground worlds. Again, huge huge thanks to Yuval for the gorgeous logo and to all of our guests for taking the time to join us this year. I hope that you enjoy reading the posts as much as I have and will find ideas for new books to read over the festive season. You can follow the Advent Calendar posts with the hashtag #StorySnugAdvent on Twitter and I will also be posting each book recommendation on Story Snug’s Facebook page, Google+ and pinning them to our 2017 Story Snug Advent Calendar Pinterest board. Hi Catherine, what a nice idea for an Advent calendar and a lovely way to share feel-good book recommendations. Wow, how lovely to have a beautiful logo like that and fantastic to have book recommendations from so many different people, so no doubt you will get a real cross-section and some completely new ideas.